Find out what people have been saying about us here! I wanted to write personally, rather than emailing, to thank you and Ryun and your whole family for doing us so proud for Serens wedding at Ashbarton. Your whole operation was beautifully run - very smooth. professional and unobtrusive. The food was absolutely delicious!. We had enough leftovers that we were able to share it our among a number of people. Also we had many delighted comments about your fantastic puddings. Blessings to you all and again many many thanks. We asked you to cater for a large family wedding party. From start to finish you both handled everything in a very professional and fun manner. You catered for 200 without hesitation and the food was excellent, thank you so much. We had lots of enthusiastic comments, which was praise indeed as most of them were hungry rugby players! There was plenty of food at a very competitive and fair price and your catering took the stress out of our evening allowing everyone the chance to relax and enjoy them selves. I can't wait to work with you again at our future parties. This is just a quick message to thank you, Ryun and your staff for all your efforts on Saturday. Your professionalism and service was exceptional. Nothing appeared to be too much trouble for you and most importantly the food was delicious. We are going to Cornwall for a few days and then I am going offshore, but I can assure you that I will be posting "rave" reviews for you once I get offshore. Once again thank you from myself, Andrea and the new Mr and Mrs Bristow. Last September I asked my work colleagues for the name of a really good hog roast company. Luckily my boss David had recently attended a friend’s birthday party and told me how delicious their hog roast was so he passed me an Oaktop business card. As soon as I spoke with Melinda to enquire, I knew that she was the right choice for me. The celebration was my silver wedding anniversary, so it was really important that I could fully trust Melinda and Ryun with what would be the main food of the evening for our 300+ guests. I was not disappointed! Ryun and Melinda were perfect hosts, and served up the most delicious meat, stuffing and apple sauce. 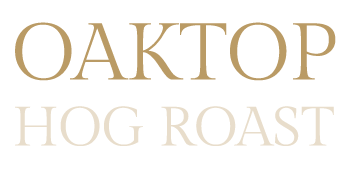 I had lots of lovely compliments throughout the evening and I am sure that I will be attending a party that Oaktop will be cooking at in the not too distant future. There are long lists of hog roast suppliers out there, however, if you are looking for a combination of great host, food and price then Ryun and Melinda will definitely not disappoint and I would recommend them to everybody I know.